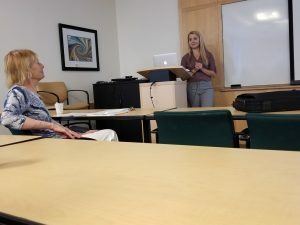 The 2019 Southern California Undergraduate Research Conference (SCURC) was held at Mount Saint Mary’s University in Los Angeles on April 13. 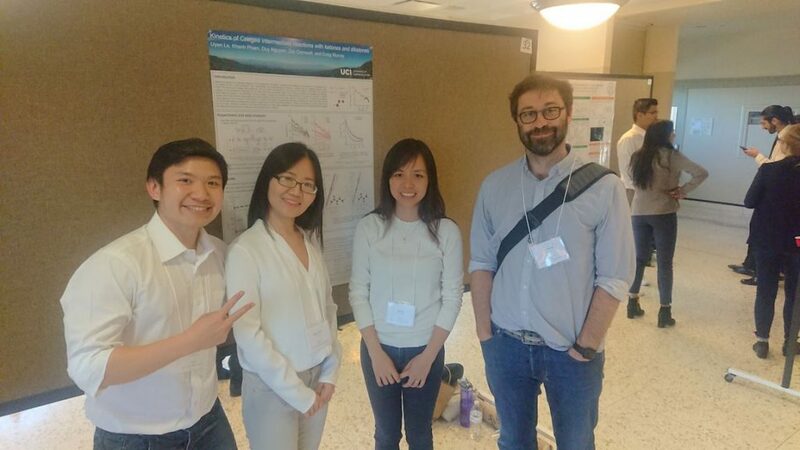 Duy, Khanh, and Uyen presented a poster showing some of their recent work looking at the kinetics of Criegee intermediate reactions with ketones. This entry was posted in News on April 15, 2019 by Craig Murray. We have been awarded $394,638 by the Chemistry Division of the National Science Foundation for a three-year project titled, “Kinetic and Mechanistic Studies of Criegee Intermediate reactivity.” The project is part of the Environmental Chemical Sciences program. We will use laser flash photolysis and broadband transient absorption spectroscopy to measure temperature-dependent rate constants of Criegee intermediate reactions with trace atmospheric gases. Specifically, we will study Criegee intermediate reactions with multifunctional volatile organic compounds, radical species, and explore the influence of humidity on reactivity. A new outreach program will establish air quality and weather monitoring stations at local high schools. This entry was posted in News and tagged funding on April 5, 2019 by Craig Murray. Four-week summer research. 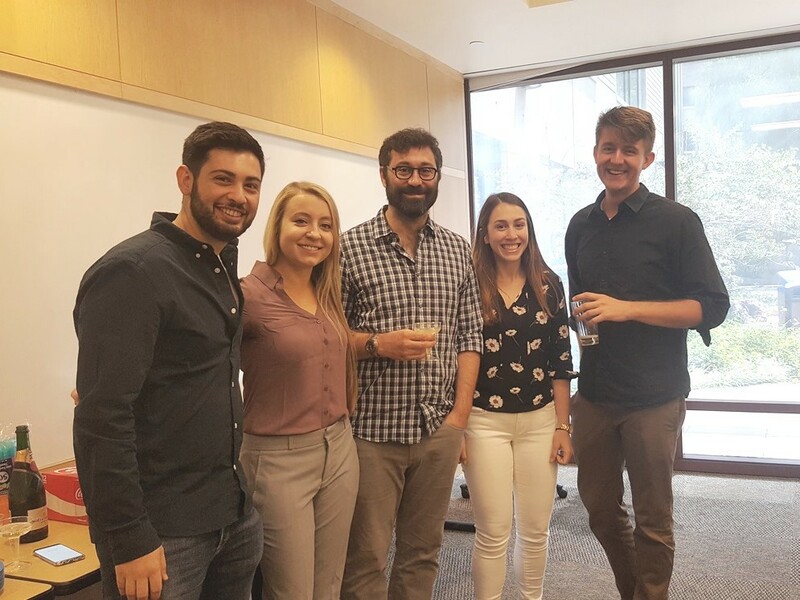 You will work directly with Dr. Murray and his research group in the laboratory and participate in other research-related activities to obtain direct experience of an academic research environment. The scheduling can be flexible to work around other commitments (e.g. weeks need not be consecutive). Class visit. You will bring your students (limited to 30 total visitors) to campus for a day. 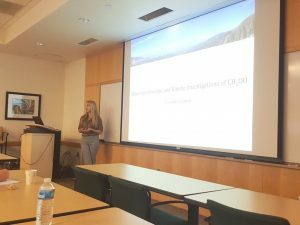 We will provide tours of various research laboratories and host a symposium to discuss research, educational opportunities at UCI, and current issues in environmental and atmospheric chemistry. The ‘Teacher-in-Residence’ program is funded through an NSF award (CHE-1566064). Participants will receive a modest stipend during the summer and costs associated with the class visit will be covered. If you are interested in participating and experiencing a real academic research environment, or have any questions about the program, please contact Craig Murray (craig.murray@uci.edu) directly before May 10, 2019. This entry was posted in News and tagged people on March 22, 2019 by Craig Murray. We explore the UV photofragmentation dynamics of acetaldehyde cation in our latest paper published in PCCP. Single-photon VUV ionization was used to prepare cold acetaldehyde cations that are subsequently excited (and fragmented) by UV radiation. The photochemistry is surprisingly rich; we use velocity-map ion imaging to characterize four different photofragmentation channels across a broad range of wavelengths. 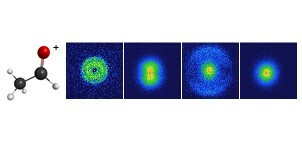 The experiments are supported by complementary ab initio calculations. The article will appear in a special themed issue of PCCP on Photodissociation and Reaction Dynamics that will be published to celebrate the 65th birthday of former University of Bristol colleague Prof. Mike Ashfold. This entry was posted in News and tagged paper on December 11, 2018 by Craig Murray. 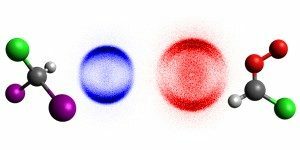 Our latest photodissociation dynamics paper has been published in PCCP. The new paper describes ion imaging and photofragment excitation spectroscopy experiments exploring the photochemistry of acetone. 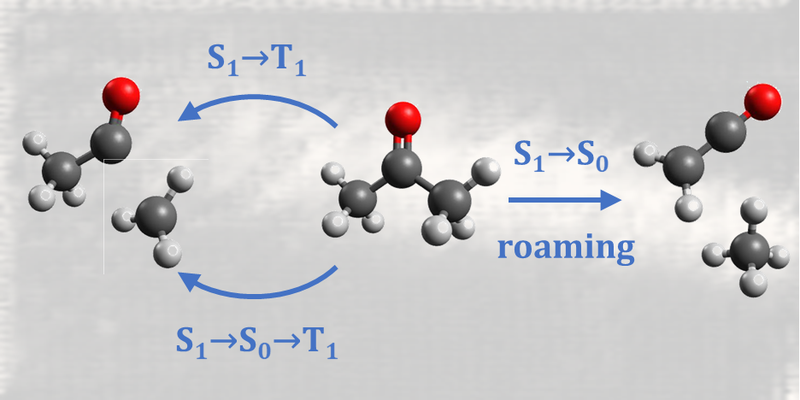 We identify ketene as a new primary photoproduct following excitation to S1 and suggest that a roaming mechanism may be responsible. 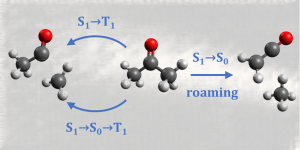 The radical channel forming methyl and acetyl is characterized over a broad range of wavelengths and is dominated by dissociation on the T1 surface following intersystem crossing. 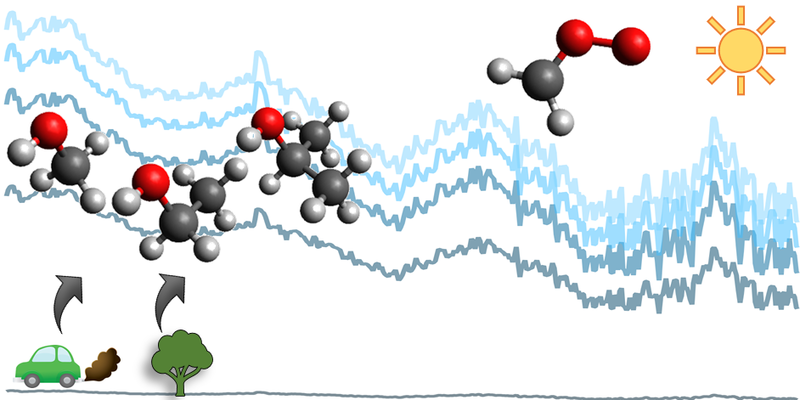 Time-resolved measurements using a ps laser system at 266 nm, find an intersystem crossing rate that is surprisingly around six times slower than in acetaldehyde. This entry was posted in News and tagged paper on January 9, 2018 by Craig Murray. Our new paper published in J. Phys. Chem. A. combines broadband transient absorption spectroscopy with complementary ab initio calculations to explore the kinetics of the reactions of the simplest Criegee intermediate with a series of alcohols. 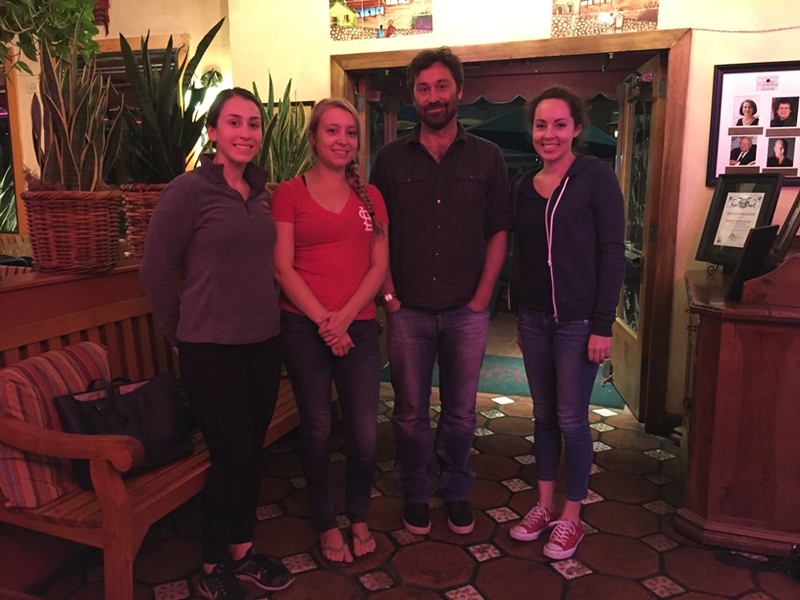 The results of this study provide new insights into trends in Criegee reactivity. This entry was posted in News and tagged paper on January 3, 2018 by tadayons. Our most recent paper published in Phys. Chem. Chem. Phys. explores the photochemistry of chlorodiiodomethane (CHI2Cl), a precursor of chlorinated Criegee intermediates. Velocity map ion imaging experiments and high-level ab initio calculations were employed to characterize the photodissociation dynamics of CHI2Cl over a range of wavelengths. We further used transient absorption spectroscopy to measure the UV absorption spectrum of a chlorinated Criegee intermediate, ClCHOO, produced from the reaction of CHICl with O2. This article was selected as part of the 2017 PCCP HOT Articles themed collection. This entry was posted in News and tagged paper on November 22, 2017 by kkapnas. 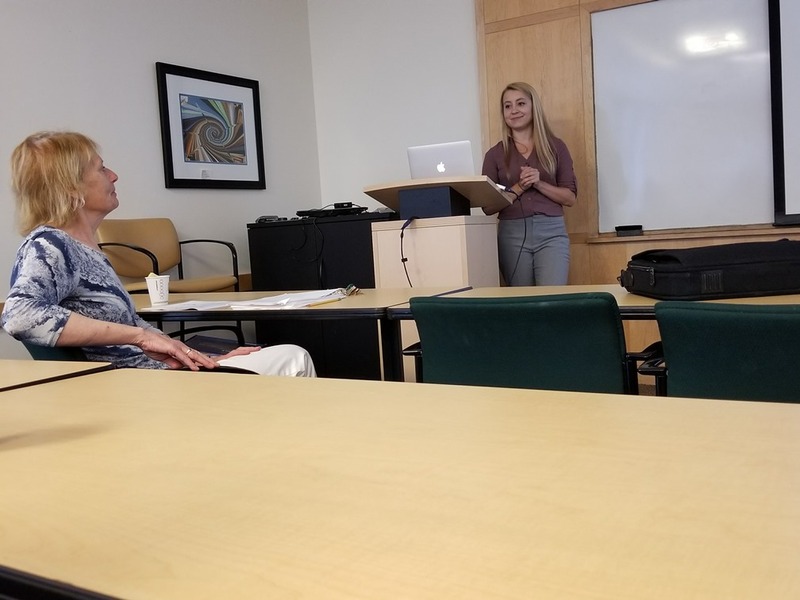 Congratulations to Liz, who successfully defended her PhD dissertation last week despite the best efforts of an antique laptop to derail her talk. 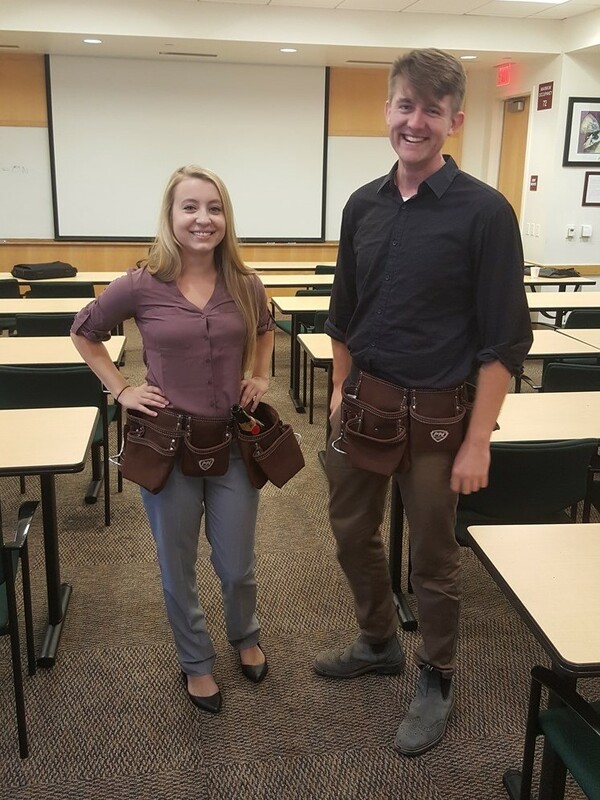 The defense was concluded with the conferral of her ceremonial tool belt. It was also great to see Ben again, who belatedly received his. We also said farewell to Liz this week. 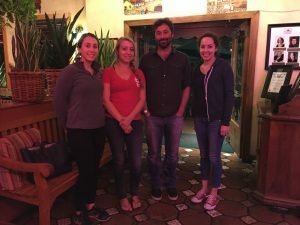 Liz moves to New England, where she will begin a post-doctoral position at MIT, working with Profs. Bob Field and Christopher Cummins. We wish her every success in her new job! This entry was posted in News and tagged people on August 4, 2017 by Craig Murray. 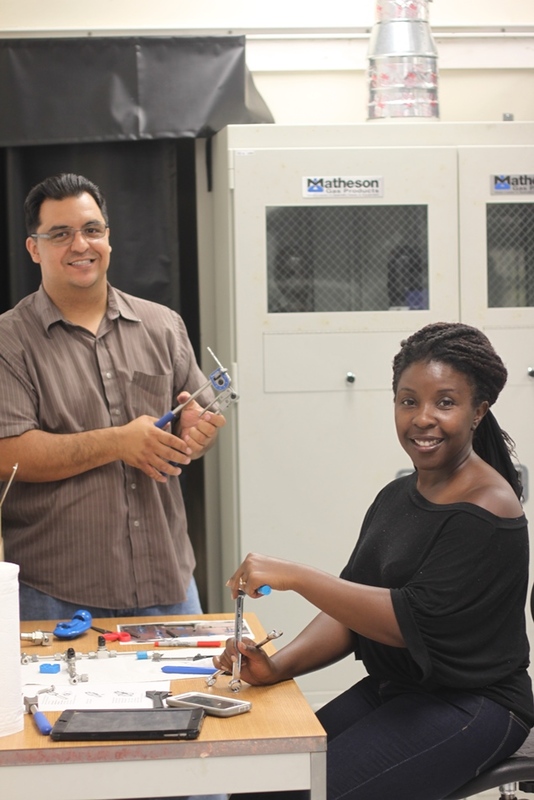 We are delighted to welcome high school teachers Larry Sepulveda (Rosemead High School) and Linda Kazibwe-James (Whittier Christian School) to the group. Larry and Linda are participating in our NSF-funded ‘Teacher in Residence’ outreach program this year, and will be working with us in the lab for the next month. The program aims to provide high school teachers with hands-on experience of life in a research laboratory. This entry was posted in News and tagged outreach on July 21, 2017 by Craig Murray. 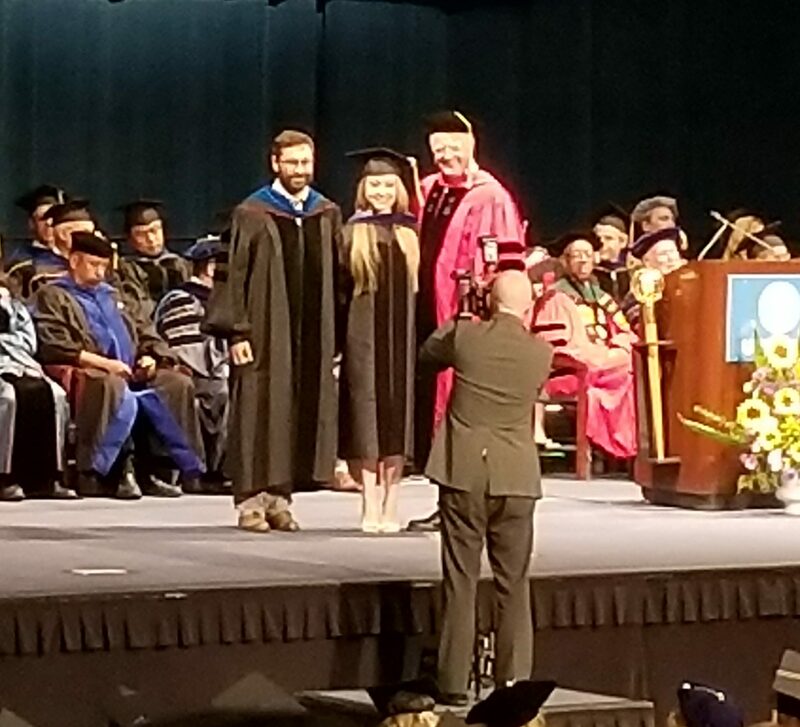 Last Saturday, Liz was hooded by Craig as a (soon-to-be) Doctor of Philosophy! The ceremony was held at the Bren Events Center and honored the hard work and achievements of the class of 2017. Craig did a great job with the hooding (no hats were knocked off!) and everyone’s efforts were rewarded with a champagne reception following the event. Liz gives the experience two thumbs up! This entry was posted in News and tagged people on June 21, 2017 by tadayons.